As I mentioned yesterday in my ill-fated rant about announcers, the National Association of Broadcasters (NAB) is filling Las Vegas’ finest hotel rooms for a few days, and the air is thick with the smell of exhibitors pitching clients in their booths, and attendees in their hush-puppies rushing to-and-fro to make a seminar on time. The health of TV and radio in the marketplace directly effects the fortunes of voice-actors, and I gotta tell ya a lot of people in “traditional media” are scared. The rest are adapting. The demise of newspapers in the form of a hand-held paper ‘n’ ink media is going the way of the Pontiac and the Plymouth. Those that survive will go online. Radio and TV have been digital for years, now, so their market share is tenuously on hold. It’s not likely either will go away, but the signs of change are everywhere. News, music, and entertainment consumers are already moving way past the desktop or laptop and are now trending lickety-split to mobile (smartphone or tablet) computing. Many TV viewers watch their big screen with an iPad in their lap. Content providers (like KLAS-TV (CBS), Las Vegas) can’t just post the same newscast stories on the Android HTC smartphone, or an iPad as they do for their traditional news viewers on the TV…each platform deserves to have content tailor-made to take advantage of that device’s unique properties. That requires a lot of coding, and it ain’t cheap. In the midst of it all, the challenges of monetizing these new mediums is a long-shot from replacing the lucrative revenue streams TV outlets enjoyed for decades. What does it mean for Voice Over Artists? The jury is out. but brevity is in. So is video. You’ll start to see copy change to reflect shorter attention spans. More may be expected of you in helping to promote the very products that you just voiced. And it might not hurt to brush-up on your social media skills. Ah, so that’s what you were getting to, huh CourVO? Well…er…uh…yeah, ’cause I happen to believe it’s true. So much so, that I spent a good bit of time yesterday with a bunch of other like-minded traditional media people forging our way into new media realms. The rag-tag ad-hoc group was comprised of TV, technical, freelance, an Aussie, a lawyer, media buyers, a marketing exec, and others. No two alike. All enamored of the possibilities of Google’s new social media experiment. Is this the new face of media? 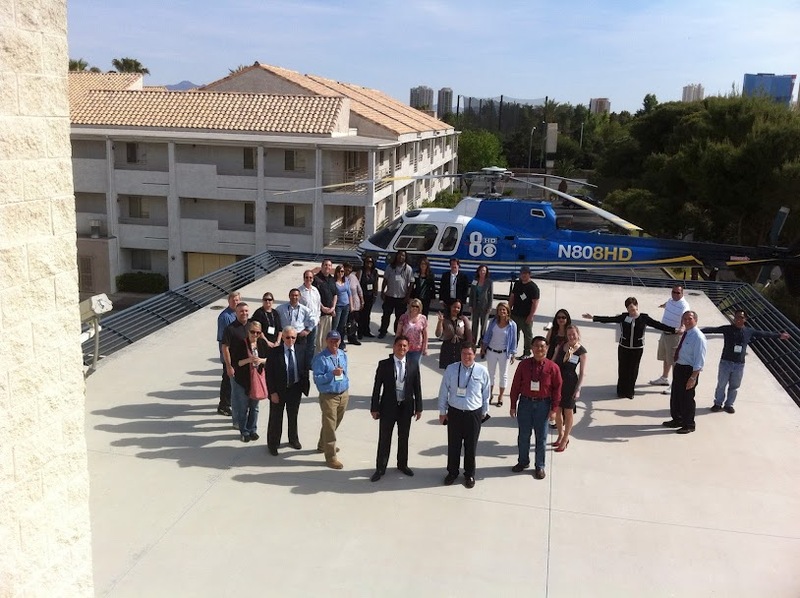 In the photo above, about 30 of us gathered on the Channel-8 helipad, and formed a big G+ (OK, you have to really look to see it) in honor of Google Hangouts I’m part of the “plus sign”). Anyone can do a hangout from their G+ page. It’s like a video-conference call on Skype with 10 people…only it’s free. Our group gathered to engage in a new variation on the theme: a HIRL (Hang-Out in Real Life). We gather in person, and engage the HangOut to bring in even more people virtually. Newsrooms everywhere are playing with the potential of this new platform, and I’m glad to be a part. What I learn here in TV-land augments my understanding of its application in my voice over business and vice-versa. These are heady times in the world of relationship-building via Social Media. There’s a lot of flailing around. Things change quickly. Keep up or drop out. Jump in anywhere and be a part. No need for Hush-Puppies.